My uncle Luís Miranda was born in the Philippines. He was the first cousin of my grandfather Tirso de Irureta Goyena. Before WWII he pioneered the production of Coca Cola in Manila, perfected Magnolia Ice Cream and invented such flavours as macupunó which is made from a very special coconut and Pinipig Crunch (a pre Nestle crunch type ice cream made from immature glutenous rice). Best of all he made sure that every bottle of San Miguel Beer was the best that could be had. He was prosperous and had a sprawling house designed by his architect brother Antonio Miranda. He had a beautiful wife, Fermina, who cooked with a perfection I have not ever seen matched. When the Japanese landed in Manila, Luís made sure his beer would not be readily available to the Japanese. Perhaps the invaders found out of Luís's late night tinkering at the beer plant, because they commandeered the Miranda house as their headquarters. After the war the Miranda family managed to make it to Buenos Aires where Tio Luis again worked for Coca Cola. That's when I first met my Tía Fermina. 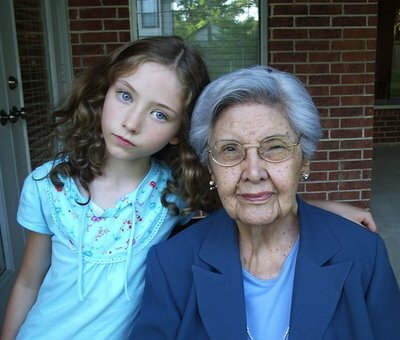 I was 8 which is precisely the age of Rebecca seen here with Tía Fermina who is 94. On our way back from Morelia we stopped so that Rebecca could meet her. I have always hated cake. But I was never ever able to turn down Tía Fermina's magnificent angel food cakes or her Spanish ensaymadas. I learned to enjoy her Filipino cooking. Even her white rice was better than any I have ever had. The only Argentine style pizza to be had in Mexico City was hers. When I married Rosemary 39 years ago in Mexico, Tía Fermina (who had also moved to Mexico from Buenos Aires) lent us her old white Peugeot 403. Only she could love a car with a hidden fourth gear (I drove it for a week in third) and with door buttons that had to be pulled up to lock. We often visited the Mirandas at their house on Miguel Cervantes Saavedra. My Tío Luís would nag Rosemary into eating more. I never had to be nagged. Many of our family, and the Filipino community in Mexico made it a habit of going to the Miranda's for weekend lunches or dinners. Tía Fermina would set many tables in her large dining room and living room with extra ones in her patio garden. Various generations of children experienced the delight and honour of stepping up from the little children's tables to finally making it to the head table. Christmas was never Christmas until one saw the tree decorated by Tía Fermina's eldest daughter, Carmencita or tried the cookies made by the youngest, Rosario. In a short time my favourite aunt became Rosemary's favourite aunt. At 94 Tía Fermina is all energy, memory, wit and her appetite for sweets has not diminished. She presides over her great grand children, admonishing them gently with her beautiful Spanish or switching into her accented Filipino Spanglish that even Rosemary has learned to speak. While in Houston for a day, we had the privilege of having sinigang, a Filipino soup and a dessert, both made by the supreme cook. I will never forget her in Mexico washing her vegetables with FAB detergent while wearing her rubber gloves. That Rebecca will some day be able to re-tell these events gives me a joy to be alive and to wish my Tía Fermina many more years.